Looking for Bed Bugs Pest Control? Bed bugs in Sydney NSW are insects of the Order Hemiptera and Family Cimicidae, which has over 90 species around the world and 2 in Australia, the common bed bug Cimex lectularius, and the tropical bed bug, Cimex hemipteus. Bed-bugs are wing-less, parasites that feed off the blood of animals. The common bed bug (Cimex lectularius) is a pest of humans this species has recently become a problem in Australia and other countries all over the world. Bed bugs have three basic life stages; egg, nymph, and adult. They begin as a very small but visible egg, hatch to become a first instar nymph or juvenile, which is 1 millimetre long or about the size of a poppy seed. There are five juvenile stages, which feed on blood, moult and grow over time. The adult is about the size of an apple seed. Bed bugs tend to gather together in hidden and undisturbed places where a person sleeps, or sits for an extended period of time. adboard, and the rest of the bed frame for live and deead ones. You will sometimes see of live bed bugs or their shed cuticles (skins), or maybe dark marks of faecal spots, and even their eggs. They breed incredibly quickly, so in heavily infested areas bed bugs may be found in nooks and crannies anywhere in the bedrooms and living areas of your home. They will leave their castings and droppings everywhere, so be on the look out!. A faecal mark, looking similar to a black or brown stain may appear on surfaces of fabrics. Eggs are cemented to fabric, wood, paper, and most other surfaces as the female hides or wanders in search of a host. It is unclear exactly why and from where bed bugs re-emerged as a pest in our homes, dormitories, hotels, and shelters, but the resurgence was noticed throughout the world in the late 1990’s. Before World War II, it was estimated that nearly 30% of Australian homes had bed bugs. From the 1950’s a lot of residual sprays including DDT, chlordane and Dieldrin were often italicised inside dwellings, which although dangerous to health, slowed down the bugs’ proliferation. As such, BedBugs were nearly absent for 50 years in Australia. However, stories and reports indicate that bed bugs may never have truly disappeared in Australia but they were very uncommon, until recently. Where Do Bed Bugs Hide Out? Customers often find it very hard to pinpoint where the bed bugs are coming from. This is due to the fact that Bed Bugs are capable of squeezing into tiny cracks on furniture, bedding, and even between floorboards. As such you will often find that treating them with a can of mortein is very ineffective. To successfully exterminate bed bugs you need to ensure that all areas are appropriately treated with a pesticide that targets the control of bed bugs. Important areas to treat are; floorboards and carpets, bedding, furniture, cracks and crevices (treatment with a power based pesticide) as well as the boundaries of rooms to prevent the bed bugs from traveling to other areas of the property. We also incorporate the use of specific bombs that contain not only a broad spectrum pesticide but an Insect Growth Regulator (IGR) as well – ensuring that the bed bugs don’t reproduce and reinfest down the line! 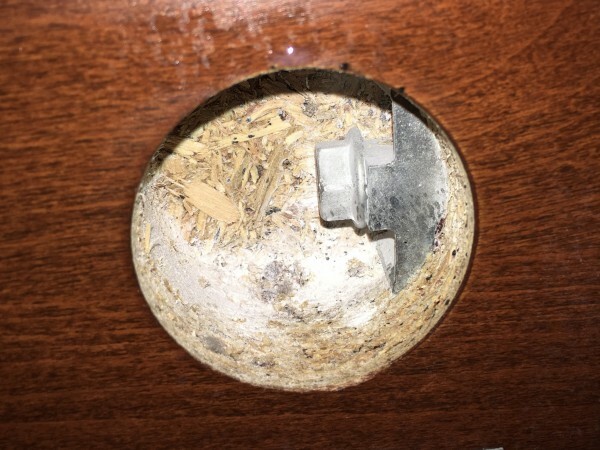 In the picture below you can see how bed bugs have been identified in a small cavity which a wooden beam slides in to, making it exceptionally hard to find them without dismantling the whole bed! Are Bed Bugs a Seasonal Issue? The short answer is no. Bed Bugs are a year round threat and are most prolifically found in hotels/motels/B&B’s due to the fact that they spread through travel! Everyone knows how disgusting it is to overnight at an establishment that has bed bugs through the linens, they’re never a welcome sight. Bed Bugs flourish in densely populated rooms with a high amount of people traffic. 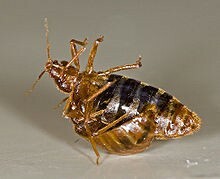 As such we would recommend quarterly or 6 monthly bed bug treatments if you own a business providing overnight stay. We offer comprehensive bed bug treatments that incorporate 6 different treatment strategies which results in a thorough and LASTING treatment. Call us today to get those bed bugs gone! What is the risk of having bed bugs? Bed bugs must bite to feed on blood. They have somewhat pointed mouth parts, just like mosquitoes, and are known to feed for only a few moments on your blood. They always must feed on hosts in order to grow, & although they will primarily feed at night-time, bed-bugs will sometimes bite during day-time. Bed bugs in Australia have never transmitted any disease at all to human beings. It is known that common symptoms of bed bugs are the itchy welts of victims, though some victims will not show any welts. Reactions may vary widely & bites by themselves can’t be used to confirm the existence of a bed bug infestation. Bites to some unfortunate people may lead into other more serious secondary infections by the scratching of the bites. In some situations, Anemia has been reported locally in chronic infestations. This has been where elderly persons and the very young in cases where their homes have been rather heavily infested with the bugs. Also Asthma has recently been linked overseas to bed-bugs infestation in houses. More risks can arise with the use of insecticides to treat bed bug problems in the home, particularly when individuals attempt to eradicate bed bugs without the help or advice of a professional pest manager. People with no pesticide application experience are using surface spray, fly spray, and sometimes illegal products to attempt to control bed bugs in their homes. It would be easier buying bed bug mattress encasements, castor or a screw in barriers which have a sticky impassable barrier. Bed bugs can be transferred among people, and that places a great deal of social, emotional and financial stress on sufferers. Control is challenging and costly, and there is still a certain amount of social stigma attached to living with bed bugs. Having bed bugs may restrict the social lives of people. Sufferers avoid visiting friends and family and often throw away belongings, at great cost, and minimal benefit. Rental disputes often occur over who is responsible for the infestation and re-location costs while treatment is taking place. A1 Pest Control are experts at fast and low toxic control of these pests and this strategy helps resolve these types of problems. Pesticides alone, or the use of any single method, will not eliminate bed bugs. A strategy that includes a number of methods is absolutely necessary, especially in multiple unit facilities like flats, shelters, dormitories, medium density estates, and hotels. Newer non-toxic means of controlling them are with special silicone discs that are fitted around the legs of beds and screw-on castors with a sticky base. Management of bed bugs should begin at the first sign of a problem. The longer an infestation is allowed to exist, the more difficult and expensive it will be to control. It may take several months to get rid of bed bugs if there is a large infestation. There must be cooperation among tenants and the management staff in multiple dwelling facilities. A bed bug management program must be coordinated for the entire building as well as the individual room or person, because bed bugs can go undetected for long periods of time and can spread very easily through walls, on electrical and plumbing conduits. Cooperation from the tenant includes following the pest reporting procedures, cleaning and preparation of the room for treatment, and taking measures to avoid reintroduction of bed-bugs. Building management must ensure that tenants are aware of these procedures and are provided with the necessary contact information they need to report a complaint. Complaints must be addressed in a timely manner. Most building managers cannot deal with a bedbug infestation without the help of a pest management firm. A pest control technician should be involved at an early stage. Professionals know how and where to look for bed bugs, and can thoroughly assess an infestation to ensure the right measures are taken. Bed bugs are small but visible insects. Adults which can be as long as 7 or 8 mm when fed. The newly hatched nymph is very pale until it feeds. Then it looks like a tiny droplet of blood. Each nymph stage will feed and become filled with red blood. The adult is about the size and shape of an apple seed, and dark red to brown in colour and as flat as a credit card before feeding. The first sign of a bed bug infestation is usually the appearance of bites on the arms, neck, torso, or legs. One may also find live or dead bugs. Collect a sample for positive identification. Clusters of small stains or droplets of dried blood on furniture and bedding may also be found. These stains are the bed bugs’ faecal droppings. They may be accompanied by shed skins, because bed bugs shed their outer skin, or moult, as they grow. Shed skins are amber in colour and resemble the shape of a bed bug. There may also be live bugs and eggs where droppings are found. DON’T mistake bed bug droppings for cockroach poo. Cockroaches drop little pellets, not round ones. 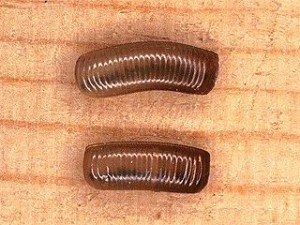 There may also be Oothecas (egg cases) see belowor dead cockroaches nearby. When searching for bed bugs it is important not to overlook the nymphs, which can be difficult to spot. Look for nymphs where droppings and stains appear, especially in crevices on fabric and wood surfaces. A newly hatched bed bug is smaller than a poppy seed and the colour of a sesame seed. The stains from droppings can appear as rounded bumps or blackish, soaked-in stains. This adult bed bug is waiting to feed on blood. Adults are very flat and fit into crevices as thin as a credit card before they feed. Nymphs are even thinner. Once fed, they are longer and plump until they begin to digest the blood meal. Bites are usually the early warning sign of a bed bug infestation. Bed bugs feed only on blood. Each life stage feeds, except the egg. They insert the fine stylets from their beak directly into the skin in search of a tiny blood vessel, and may move and bite repeatedly until they find the right spot. At each point the beak releases saliva into the skin. The saliva contains proteins and enzymes that will cause an allergic reaction in many people. This bite can leave small itchy red welts or white bumps, or sometime blisters or even pustules may result. Some people do not have any reaction at all, even though they are bitten the same amount of times in the same areas. Not everyone in a residence will react the same way and many times only one person will show signs of bites, leading others to believe it cannot be bed bugs and just imagined by the sufferer. It is critical to confirm bed bugs in the sleeping or living area through inspection to be sure that bites are caused by bed bugs and not by other pests. We have Bed-Bug Detectors for commercial hire, and also sell mattress encasements that they can’t escape from, saving your current mattresses! Call us on 0417 251 911 for more info. For Canberra residents, you can contact my sister company A1 Pest Control Canberra (Yes, she really is my sister!) for Bed Bug control Canberra. Bed bugs primarily feed at night in the dark, in a typical situation. Under stressed conditions bed bugs may feed during the day. If local temperatures are over 25° C and the individual is outdoors or has unscreened windows open, mosquito bites must be considered. Mosquitoes may breed in water in subfloors or sinks, disused toilets, indoor drains, pans in the refrigerator, dog/cat water bowls, pot-plants, or unused fish tanks. A thorough inspection will identify and uncover these environments. Pets or wildlife, including foxes, squirrels, rabbits, and rodents may carry fleas that bite humans, especially in warmer months. There are other causes of bites and lesions aside from bed bugs. While bites can vary, the activities of the person bitten may help determine the cause. Mosquitoes – Generally, mosquitoes feed at dawn and dusk, but at least one species bites during the day. In most people, a wheal and flare reaction is common and occurs quickly. Mosquito bites are usually associated with warm weather and being outdoors. A torn or missing window screen allows mosquitoes into the living area. Head, body, and pubic lice – Lice live on the human body, feeding by penetrating the skin. Head lice live on the scalp among hairs, body lice live in clothing and feed on adjacent skin, and pubic lice feed among the hairs of the pubic region. Look for signs of lice and their eggs (nits) in the hair and clothes. Ticks – They are usually found in bushy locations and grassy areas. A tick will insert its mouth and biting parts well into sensitive skin and will remain attached until the feed on its blood is completed. They will tend to remain in this position (for up to three days), and will become more noticeable during this period of time. Fleas – Flea bites are usually associated with the presence of animals serving as flea hosts, such as pets and occasionally wildlife. Fleas usually produce lots of bites in the region of the arms and legs. Bird and rodent mites – Associated with birds, rats and mice nesting in or on the building. Bird mites are usually spotted when young birds and their parents leave the nest. Mites may be seen on windowsills or air conditioning units. Most mites do not live long off the host but will bite people, if they get onto the skin. They do not cause serious bites or transmit disease. Mites should be cleaned up with soap and water. Birds should be discouraged from nesting on the building or in AC units. Scabies – Scabies is a mite also known as the human itch mite. Its a parasite that immerses itself into your skin, producing little welts which contain mites and their eggs. Scabies is transferred among humans by close contact. This is a medical problem that should be confirmed by a doctor and treated with cream or lotion applied to the body. Scabies are not a pest management issue, and do not require treatment of a room or home, however bedding and clothes should be laundered at high temperatures for sanitation reasons. Is YOUR home protected from Bed Bugs? Remember A1 for your home’s complete bed bug control and pest management systems. It’s pretty much impossible to have a solid night’s sleep if you’re sleeping in a bed beset by bed bugs. Their bites can also be frustratingly painful, leaving you annoyed and itching. Though they have been known to be a persistent pest and part of life, you can take peace in the fact that there are plenty of options to treat the problems that they cause. They are scientifically identified by the name “Cimes Lectularius”, they are minute, flightless pests that are found globally and are by no means exclusive to any one region. Similar to other night time parasites they operate in finding a human host during the evening and night while they lie dormant during the day. They are usually found inside as well as on top of mattresses and linens as these are the most convenient places for them to find more food. These little parasites have a particularly well developed jaw and mouth, using these to assault an individual while they lie sleeping. The mouth includes an elongated peak which they employ to quickly and pierce someone’s epidermis with ease and continue to feed on blood. This process is swift, ranging between 1 and 3 minutes before the parasite is done, sadly this whole process is quite painless and you will only realize you’ve become a victim a while after the bed bug has happily filled it’s belly and moved on. You might find that a bed that’s torn up and filled with holes is very uncomfortable but this is the ideal place for a little army of bed bugs to hide. They are never picky and will stay wherever they must to be within an area where they can feed on someone. Bed bugs have also been known to live inside foam, assortments of cardboard, sleeping bags as well as water beds! These beds have little nooks and hiding places where they can snuggle down, as bed bugs prefer a warmer temperature. You can identify whether you’ve actually been bitten by one of these bed bugs if you see large weals on your skin which eventually develops into a small red mark that won’t last for more than a few days. They (bed bugs) will also bite in neat rows which will be different from the patterns created by mosquitoes; these orderly rows could also develop an itch. On occasion bed bug bites can become agitated and form blisters or they might even result in the loss of skin tissue. 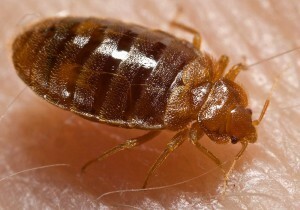 It is advised that not all bites or reactions that resemble a bed bug bite are necessarily caused by these parasites. Individuals who find themselves with similar symptoms should strive to identify whether bed bugs are the cause by finding them or getting in touch with an expert to do so. Don’t worry about contracting any violent or painful diseases from bed bug bites, the extent of their bites are usually limited to itching, swelling as well as causing the skin to inflame. By cleaning the bite off with soap and water is an appropriate way to handle the bites at home; there are also various anti-inflammatory and anti-itch creams available at the pharmacy. Trying to scratch the bitten area will only further aggravate it which could lead to an infection. In cases with serious swelling it is advisable to ice the area which will in turn minimize the swelling. If the pain persists and increases there is also the option of getting a prescription pain-killer. Spraying DDT has been a popular practice of getting rid of bed bugs years ago but has been banned because of the possible complications it might cause to humans. Treatments available today are more focused and judicious. Inspecting a bed bug infestation usually takes a few hours. Homeowners that hire professionals to solve their bed bug problems should follow certain procedures before a room or house if treated. Garments or bedding that are badly infested need to be discarded, as these cannot be sprayed with insecticides. Reducing clutter is also a requirement. Rooms filled with belongings will just slowdown inspection and treatment. Garments or bedding badly infested need to be discarded, as these cannot be sprayed with insecticides. Reducing clutter is also a requirement. A room filled with belongings will just slowdown inspection and treatment. Bed bugs cannot survive any area with temperature of below 0 degrees Celcius . However, any attempt to kill bed bugs by chilling a room has a low chance of success, as the cold temperature should be maintained for at least two weeks. Pest control experts such as A1 will normally use a wide array of aerosols, low-odour sprays or dusts. Maintaining proper hygiene and cleanliness is the best way to avoid bed bug bites. Bed sheets should be changed at least once a week and floors especially those carpeted need to be vacuumed frequently. If possible, locate the home of the bedbugs and spray it with a special insecticide to kill a considerable number of these unwanted visitors. Best Bed Bug Mattress Encasement? At least 70% of bed bugs present in an infestation colonise the mattress and infrastructure of the box springs. If there is an infestation, our zippered encasements will eliminate the opportunity for bed bugs to find a home. This type of protection has the patent pending “Zipper hook”. This is now certified to protect against bedbugs. BugLock® has recently achieved an accreditation as a Pest Control Management Product in the United States. Several “Bite Tests” and “Penetration & Escape Tests” were also performed with success on the BugLock®’s “Ultimate” brand encasement with a zipper. This later was tested by the best certified entomologists to determine whether or not bed-bugs may feed on people via penetrating the fabric. This type of test also worked out whether the identical mattress encasements can be utilised as a part of a bedbug eradication, exclusion/ inclusion plan. It was found out from these tests that the offending bed bugs have absolutely no way of penetrating the fabric to get to human feeds. This proves that BugLock®’s has an ability for the prevention of infestations of all species of bed bug in these mattresses and box springs. Call Bruce on 0417 251 911 or email him at bruce@a1pestcontrol.com.au if you have a problem with bedbugs.